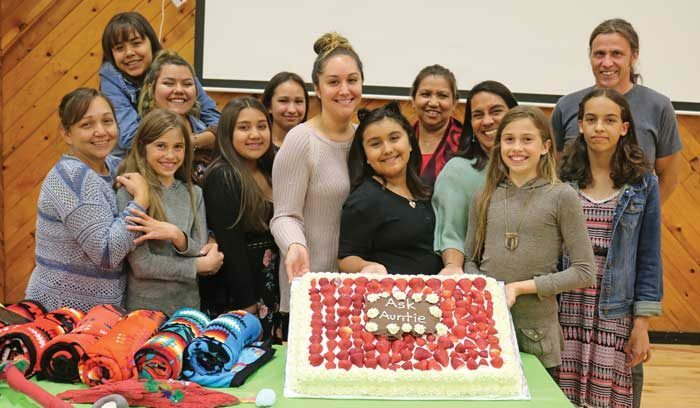 A mentor program for girls ages 11 to 15 called “Ask Auntie” was successfully brought to Tla’amin this summer, bringing back a coming of age ceremony that was previously lost during colonial contact. We at the nation were very excited about the opportunity to implement the established program at School District 47’s Outdoor Learning Centre at Haywire Bay from June 22 to 24. Myself, Brenda Pielle, Shirley Louie and Jen Ramsey facilitated. We worked closely with the learning centre along with Tla’amin Health Services and Powell River Transition House Society to make the weekend a success. The mother-daughter Ask Auntie program involved 10 girls from Tla’amin and was also open to the wider community. It was implemented as a community-based prevention and education program, with emphasis on holistic health and teachings that honour young ladies who are coming into womanhood. It was open to non-Indigenous families as an opportunity to understand traditional values that are rooted in thousands of years of teachings. We included the cultural teachings of our TAOW, which are virtues on respect for yourself and others—caring for our body, mind and spirit. Within the teachings, girls participated in two spiritual baths, talking circles, cedar bough brushings, and two workshops. After the program was finished, a special Coming of Age Blanket Ceremony took place at the Tla’amin Salish Centre, which was open to the wider community to witness. This was one of the first Coming of Age Ceremonies in recent history taking place on our territory. It was an exciting time to work in collaboration with Stopping the Violence Program, SD47, PEACE Program and Tla’amin Traditional Wellness Team who worked collectively to support young girls and their mothers. Cyndi Pallen is a Registered Social Worker with a Master of Social Work from Tla’amin Nation. For information on upcoming programs —including a workshop and support group for women centred around healing from trauma, grief and the effects of alcohol and drugs. She can be contacted through the Stopping the Violence initiative at 604-485-6965.